Have you ever noticed how many things in the kitchen you take for granted until you don’t have them? This happened to me just recently. But, like most of you who’ve experienced this, I didn’t give in, I just got a little more creative in getting around the problem and getting my sausage tortelloni with meat sauce recipe made. Curious how? Read on. As I mentioned in a previous post, I’ve been trying to make more one pot (or just a few pot) meals to cut down on the cooking time and the transportability of food to work during the week, so one of my meals this week was going to be a one pot sausage tortellini pasta with meat sauce, however, I didn’t have my pasta pot to cook the tortelloni in. Why, you say? Well, because that pot and a skillet were both beat half to death from much use and love and were starting to lose their non-stick coating. As you probably know, investing in good pots and pans can be quite pricey, so instead of doing anything about it, Sean and I just kept using them and scrubbing vigorously to clean them, until finally I got tired of it. The bright side is the pans and pots also happened to be from Analon, which has a lifetime warranty on their pots and pans, the only catch is you have to send them in to the factory to get them replaced, a process which can take a month or more. But like I said, I was fed up and wanted new pans, so we shipped them off last weekend, with our fingers crossed we’ll get new pots and pans from Analon. In the meantime though, meals became a little trickier. So I had sausage tortelloni pasta to cook and no pot to cook it in. What did I do? I used the giant wok Sean has for stir fries and curries. It’s a little unconventional, but it certainly did the job well and the tortellini pasta with meat sauce (for an extra boost of protein to the pasta) turned out pretty darn well. I’ll be taking some more with me to work tomorrow, in fact. While the pasta is cooking, heat olive oil in a large skillet on medium heat. Add the ground sirloin, Worcestershire sauce, paprika and creole seasoning and cook through. Once the ground sirloin is cooked all the way through, lower the heat and add the pasta sauce to the pan and stir to coat evenly, making your meat sauce. When the pasta is finished, drain, but save one cup of pasta water. Add the pasta water to the meat sauce and pour the pasta in as well, stir to combine everything (the pasta water helps the sauce stick better to the pasta). 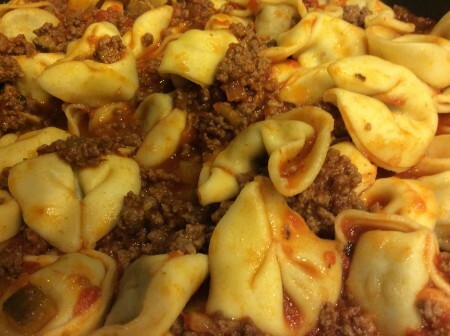 Divide tortelloni pasta and meat sauce evenly among bowls and top with parmesan cheese if desired. Doesn’t this look delicious? And it really wasn’t too hard for such a hearty meal. 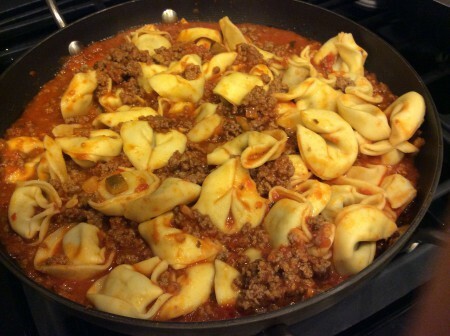 This entry was posted in Entrees, Recipes and tagged Analon, Entrees, Meat Sauce, One Pot Meal, Pasta, Pasta Sauce, Pots, Recipes, Sausage Tortelloni, Tortelloni, Tortelloni Pasta, Tortelloni with Meat Sauce on March 18, 2015 by Paige N..